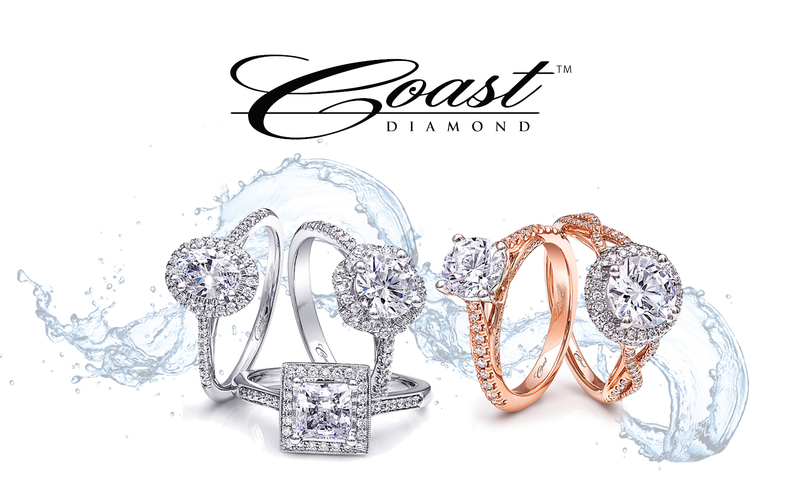 Coast Diamond’s newest designs are magnificent! Jay Gilbert has done it again with some beautiful new halo engagement ring styles. Whether your bride desires a timeless design or she dreams of a bold showstopper, Coast has something for everyone. Coast Diamond is also bringing more option to create the perfect wedding set with unique Coast Diamond wedding bands accented with sapphires or rubies. We are so excited and proud to introduce these 5 new ring styles from Coast Diamond! *Did you know? Larger engagement rings are more comfortable and slip around less if it has a split-shank. From classic to art deco, Coast Diamond stackable bands are all the rage. The classic band of diamonds can be personalized with a pop of color, like the ruby and diamond band above. Get the art deco feel with any shape you choose: circle, princess, cushion, marquise, hexagon or diamond. Milgrain edging adds a vintage feel to any ring. A Coast Diamond band is the perfect way to make your wedding set uniquely YOU. Visit our website to view the many wedding bands and stackable rings available from Coast. All of our Coast Diamond rings are customizable to your every desire. Fit your engagement ring style with a unique center stone. Choose the shape of your center stone: pear, round, princess, etc. White, yellow or rose gold, as well as platinum are available to customize the look of your engagement ring. You can even mix metals for a truly special ring. The Attention to “Floral” Detail ring customized with mixed metals. Find an authorized dealer near you, where they can help you create the Coast Diamond engagement ring and wedding set of your dreams.